Capones Restaurant and Jazz Club (website, map, 1141 Hamilton Street, Vancouver, BC, Canada, phone: 604-569-1770) is one of Vancouver’s hottest places for live jazz music in the downtown core. Located in the trendy Yaletown shopping and restaurant district (which is accessible via the Yaletown-Roundhouse Canada Line train station), Capones features live jazz music 7 days a week combined with their upscale and sumptuous food reminiscent of the great pizza, pasta, and other meat and seafood specialties found in New York’s fine jazz eateries. Capones recently underwent a major renovation and features a brand new bar area. I haven’t seen it yet and am looking forward to checking it out soon! I visited Capones a few months ago. For an appetizer, we ordered the baked brie cheese which was topped with fresh sweet blueberries (pictured below). 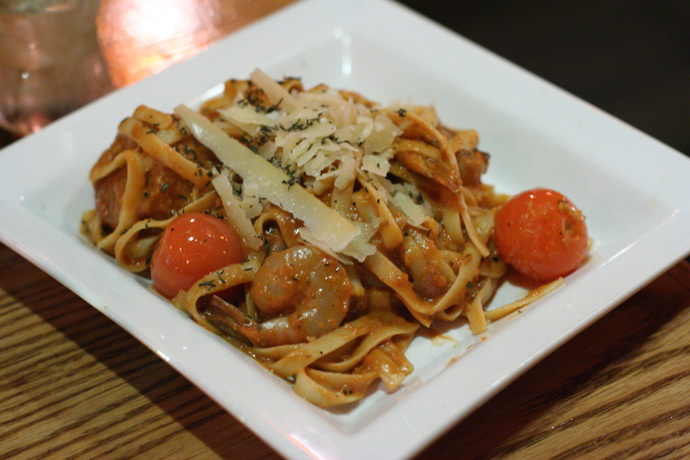 For the main course we tried their pastas, the Carbonera fettucini and the seafood fettucini (also pictured below). As usual the food was very delicious and the portions were just the right size – not too big to be uncomfortable but still enough to be heartily satisfying. Prices are reasonable considering the restaurant’s location and the quality of the food. A meal tends to be around $20 to $40 per person depending on whether you order appetizers or drinks. The music that night was provided by Phyllis Adelyne, an accomplished jazz singer with a warm personality and a classic sound drawing back to greats like Ella Fitzgerald. I can’t wait to see what great performers and tempting dishes Capones has in their lineup next. Highly recommended. 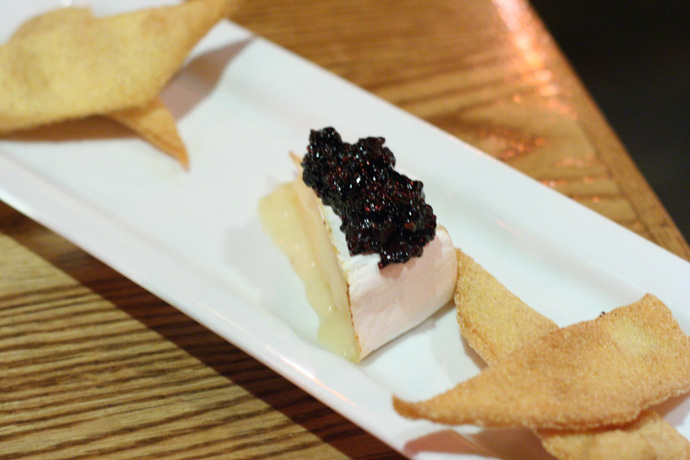 Baked Brie Cheese from Capones Restaurant and Live Jazz Club in Vancouver BC Canada. 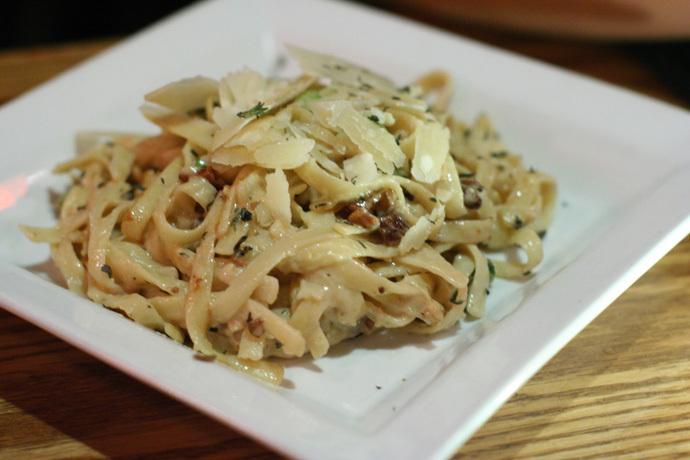 Carbonara fettuccini pasta from Capone's restaurant and Live Jazz Club in Vancouver BC Canada. Frutti di mare (seafood) fettuccini from Capones restaurant and live jazz band club in Yaletown, downtown Vancouver BC Canada. 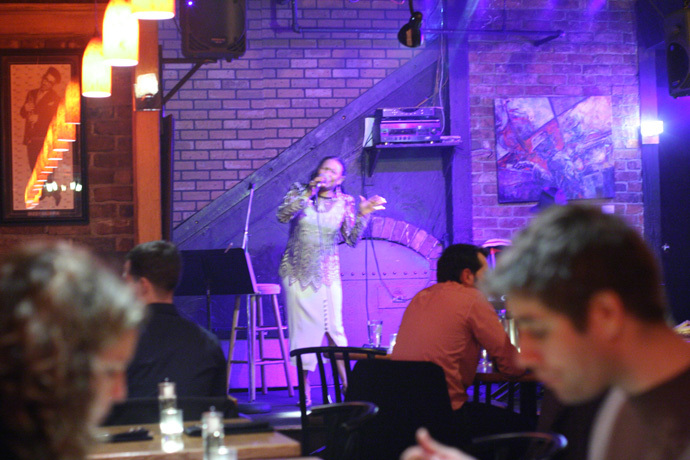 Phyllis Adelyne singing jazz at Capones Restaurant and Live Jazz Club in Vancouver BC Canada. THELOOK09 Youth Fashion Show (web site, map) is a fashion show hosted by the Jewish Community Centre of Greater Vancouver on Tuesday, May 12 2009 (the same night as the BC Provincial Election). After you vote, consider heading down to the JCCGV at 7:30pm (which is open to all, regardless of faith) and enjoy a lively evening of style and entertainment hosted by Citytv’s Lunch Television personalities Kyle Donaldson and Michel McDermott. The fashions presented at THELOOK09 are by local designers and fashion boutiques Jules & Eve and FAB Clothing, and the hair and makeup artistry is by Blanche MacDonald. The JCC teen lounge provides a place for teens to learn skills through sports, leadership programs, afterschool care, fitness and community partnering programs. Most importantly, it is a safe place with responsible young adults that get to know each teen by name and act as a sounding board without judgment. It works as a gathering place for fun and mentoring. 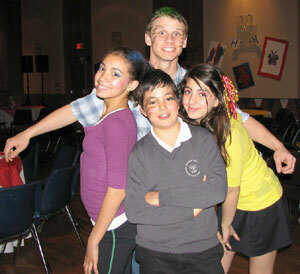 Building teens holistic health is what the youth department does best. Food for the volunteers and models is provided by local grocery stores Choices Markets, Capers Whole Foods Market, and Canada Safeway Limited – Oakridge Centre. Tickets are only $10 and you can reserve your ticket in advance by calling 604-257-5114 or by sending an email to thelook2009@gmail.com. Attention Youtube fans! Are you interested in the world of fashion design, modelling, makeup, or hair artistry? Here’s your chance to get noticed! Create a 30 second video blog answering the question “What does living a healthy lifestyle mean to you?” and upload it to Youtube, you’ll get a chance to win two VIP Passes to the fashion show, and have the opportunity to meet some of Vancouver’s top fashion designers, TV personalities, and other people like yourself who are interested in fashion and healthy living. When you upload your video, make it a video response to this video, which explains the contest rules. The full contest details can be found here. VLOG contest is about Healthy Lifestyle is open to all ages. 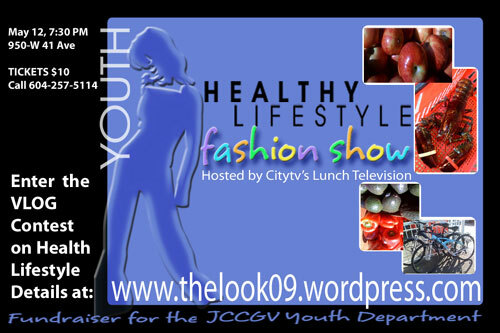 Click above for more details on THELOOK09 Youth Fashion Show in Vancouver BC Canada. Tickets: 604-257-5114 or email thelook2009@gmail.com. We hope you enjoy the great Events restaurants on Dine Out Here Vancouver.